✅ Trip Verified | This airport is very overcrowded but they are doing much needed extension. The check-in was ok and went pretty quickly. I would recommend eating before you go through immigration in the main restaurant upstairs. Very chaotic and overcrowded when airside. Thank goodness we didnt have to wait long. Nowhere to sit and very limited eating options. Massive tourism and infrastructure cannot cope. ✅ Trip Verified | My family and I had a very upsetting experience in Split airport yesterday. When we arrived to the airport for our flight home to Dublin we realised that our Mothers handbag was not in the boot of the taxi with the other bags which meant it was back at Split port as she had it just before getting into the taxi. We immediately went to both the information desk and the general check in operators. The information desk lady tried to call the port to see if it was handed in but could not get through so she rang the police at the airport who came out and advised my mother could not travel without a passport and the best thing to do is go back and look for it as we had 3 hours before the flight. The policeman advised if we did not find it to come back and we could do a report for a lost passport and my mother would then need to go to the embassy in Zagreb in order to return home which would take a few days. We were all distraught as we had very little money left between us as we were going home. The very un- emphatic lady at the check in desk advised my mam would not be able to travel without a passport so my sister and mother went back to the port to look for the bag which had her purse/mobile phone/passport and medication in it and I stayed in the airport with my partner trying to organise money and ways to get my mother home. We contacted the Irish embassy and a nice man got another lady in touch with us to advise that Aer Lingus will accept a document stating that the passport was lost so my mam could come home. I went back to the check in desk and the lady was so unhelpful and said she would look into it but that we couldn’t be sure the passport was lost. I advised my sister and mother had been gone for 1.5 hours so it was most likely they did not find it. My mam returned then and we were at the desk and the check in lady said the police man in the airport said he could no longer take the report for the lost passport as it would need to be reported to police at the port and the lady at the check in desk said it was too late to contact Aer Lingus now anyway after we lost an hour and a half of time upon their instruction. So now my mother is stranded in Croatia alone as we had to give her all the money we all had left and there wasn’t enough money for 2 people to stay and for 2 more flights home. In hindsight we should have contacted Aer Lingus for advise but usually people in airports are very helpful and give excellent advice but this was not the case in this airport. I know there is no Aer Lingus desk in Split airport but I think some training for all staff in what to do in those kinds of situations would be incredibly beneficial as the treatment of our situation there was a disgrace and it is essentially the advice of the team in Split airport that has stranded my mother in Croatia alone with no phone, support and very little money as well as now having to pay for another flight. This had been my third visit to Croatia which is why we brought our family on holiday here as we enjoy the country so much and the people but this experience has been very upsetting for all involved and I sincerely hope no-one should have to experience such a horrific end to their holiday again. Not Verified | The worst airport in the world. 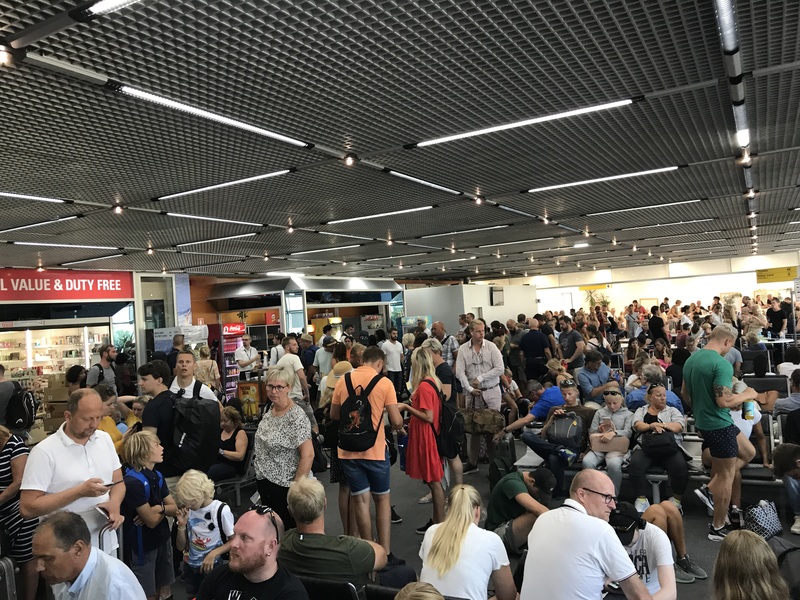 Dangerously overcrowded, woefully inadequate and simply unable to cater for the huge tourist numbers, hot, inefficient from check in onwards, impossible for those with young children or with disabilities. Avoid if possible. A disappointing end to an otherwise great holiday. 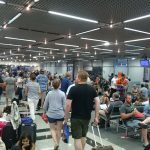 "we were treated like cattle"
Not Verified | Absolutely the worst airport I have ever experienced. Check in was shambolic with rude staff but security was disgraceful we were treated like cattle. One of our party was carrying her 20 month old little girl and clearly struggling to put her items in the plastic tray to go through scanning. A female security person told her to move it and move faster although she was clearly struggling. Totally unacceptable from people who are meant to help and from a female whom I would expect to have more empathy (where do they recruit these people?). I don't think I'll ever return to their admittedly beautiful country, they clearly rely on tourism so you would think they would improve their standards. The departure lounge was unbearably hot, no A/C and very little seating. No information boards and two tiny little cafe's selling over priced inedible food. The staff seemed totally uninterested in their jobs and seem resentful that they were there. "not enough seats and very chaotic"
Not Verified | This is the first time I have posted to this site, but after our experience today at Split I felt I had to, it was so awful. Looking through the reviews I see pretty much everyone saying the same thing. Departures was massively over crowded, not enough seats and very chaotic. The only places to get food or drink were two tiny cafe bars. They had horrendous queues and no price lists. Tea, coffee and a few sandwiches and muffins, that is it! Staff surly and busy chatting with each other, airport staff walking around with just a high vis jacket on, they could have been anybody. Split is a big city, they really need to sort this out. Get rid of the duty free and put in a couple of big cafes. It really made you appreciate Luton at the other end. We have invested in our airports and it shows. 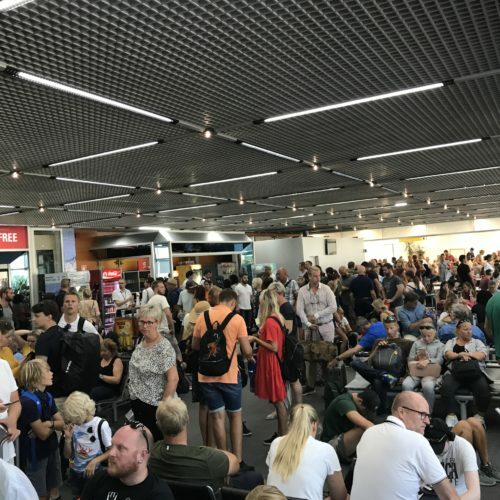 "has to be one of the worst"
✅ Trip Verified | Split has to be one of the worst airports in Europe, if not the airport. Check in complete chaos with no direction, security a complete shambles and a packed departure area with not even close to enough seating and standing areas. No restaurant and only two small coffee bars that were so crowded, you can't get close to them to get a coffee. Business lounge is hardly a lounge - it looks more like a hospital emergency waiting room. "hardly any places to sit"
Not Verified | I’ve never been to a worse airport in my life. After the security check there was one little kiosk that sold sandwiches, only with ham and cheese (sorry vegetarians). They were hard as rocks, no butter and tasted disguisting. There were hardly any places to sit, and people were standing everywhere because the lack of space so it was near impossible to get to anywhere without elbowing past a herd of people. The wifi was really slow as a bonus. ✅ Trip Verified | The worst airport ever! The waiting zone by the gates was totally overcrowded. People were sitting everywhere also on the floor. It was hot with no ac. Terrible music was played in the background therefore we were not able to hear the announcements. The are no elevators. You have to struggle up with all your belongings between people sitting on the stairs because there is no other space to sit. Unfriendly employees everywhere - especially at security control. If you want money from the tourists spending there holidays around: please treat them as guests. We had to wait three hours for our flight and could login to the WIFI for only one hour. Time is limited. "worst airport I have ever been to"
Not Verified | Was here yesterday, waited 45 mins in a queue of 10 people to get checked in then once we got through security and then passport control it was like a cattle market, no air con, no available seats with everybody sitting everywhere on the bins, stairs, floor etc.. No management of flight queues, TV blasting whilst music is also playing in the background whilst announcements were also being made which no one could hear, long queues for the 2 cafes to just get the essential water. 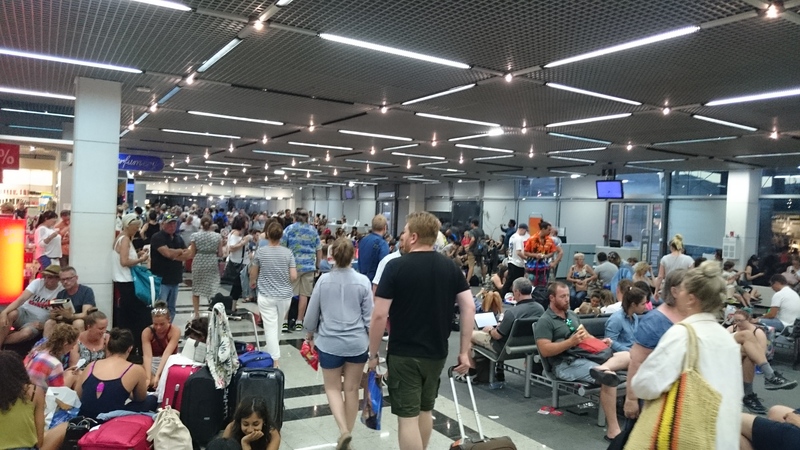 It was fine to fly into, but flying back out was a disaster, the only positive was whilst boarding the plane to leave we could see building works going on, which I hope is an extension to the airport, we usually fly into Zadar where there has never been a problem.